Digital UltraViolet and Digital Copy will makes it possible for you to stream the movie Hereditary UV Ultraviolet Code instantly to your computer and compatible Smartphones, Andriod, iphone, iPod Touch, iPad and tablets devices anytime, anywhere. 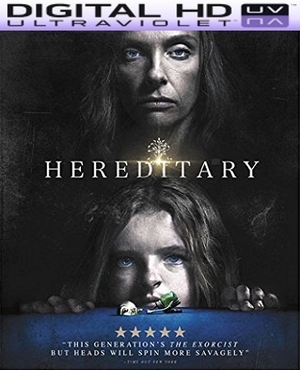 You can also download a Digital UltraViolet Copy or a Digital Copy of the movie Hereditary UV Ultraviolet Code to your computer and compatible devices. Expect more, and get more, from this horror movie. A bonafide horror classic. Whether that will be recognized today, tomorrow or the year after, that's what it is. Supremely emotional and demanding of the audience from beginning to end. I think many people's strong dislike of the movie depends on their willingness to go beyond a simple 'horror movie" expectation. Cats don't jump into frame and the sound isn't amped up just to startle you (which is what most 'horror' movies rely on now.) As a matter of fact this is some of the best use of silence that I've seen in years. The quiet dread is unsettling. Once you realize what genre the movie is you are already so altered by what went before that even if you find the genre hacky, you have never seen it in this context. Toni Collette absolutely deserves every nomination and reward there is to be offered. A true tour de force.